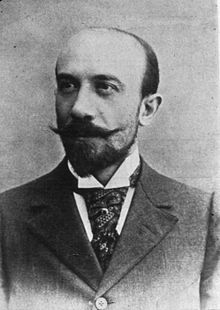 Georges Méliès (8 December 1861 – 21 January 1938) was a French moviemaker. He led the way in the use of special effects, multiple exposures, time-lapse photography, dissolves, and hand-painted colour in his work. His movies include Conquest of the Pole, A Trip to the Moon, and The Impossible Voyage. These movies involve strange, surreal voyages, like those in Jules Verne's books. These movies are among the most important early science fiction movies. Méliès's The Haunted Castle is an early horror movie. Méliès was born in Paris, France in 1861. He liked drawing and playing with a puppet theater as a child. He went to the theater often as a young man. About 1888, Méliès bought the Théatre Robert-Houdin and worked there as a magician. He became obsessed with moviemaking after seeing a movie by Antoine Lumière in 1895. In May 1896, he acquired his own movie camera and set up a movie studio. At the end of 1896, he formed a new company, Star Film. Méliès began making movies that were three to nine minute long. He wrote, designed, filmed, and acted in nearly all of his movies. He liked putting magic tricks into his movies. While filming a street scene one day, the camera stopped briefly. When Méliès looked at the movie later, he noticed that at the moment of the break, the bus he had been filming suddenly disappeared and new vehicles replaced it. Making items appear and disappear by stopping and starting the camera would become one of his most commonly used movie tricks. In 1902, Méliès produced his first masterpiece, A Trip to the Moon. It was inspired by several works of the time that speculated about life on the moon. H.G. Wells and Jules Verne wrote about space travel, for instance, and Offenbach composed an opera about a trip to the moon. Trip was a huge success in France. Méliès hoped to make a fortune showing it in the United States. Thomas Edison and other moviemakers made copies of Trip however, and made money on Méliès's work. The Sun swallows the spaceship in "The Impossible Voyage"
Scene from "The One-Man Band"
Clip from the hand-colored version of "A Trip to the Moon"
Musser, Charles. History of the American Cinema: Volume 1, The Emergence of Cinema. Charles Scribner's Sons, Inc. 1990. Wikimedia Commons has media related to Films by Georges Méliès. This page was last changed on 7 May 2018, at 04:46.